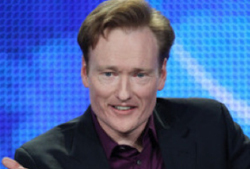 Conan O’Brien will begin his run on TBS with some of the biggest names in entertainment and music beginning Monday, Nov. 8, at 11 p.m. (ET/PT). The premiere night of Conan from Stage 15 at Warner Bros. Studios will feature Seth Rogen and a musical performance from Jack White. Where talk shows fear to tread: "Armchair Expert with Dax Shepard"